Starting your day off right is so important, but can be challenging. I have been really bad with my morning routine for the last 5-6 years, and it wasn’t until just recently that I realized how much it affected me…in a negative way. I want to work with you guys to make all of our morning routines stress free and enjoyable. I’d love to hear what your morning routine is, and if you are happy with it. What would you change? How would you feel if you changed it? I love th is quote because for me it has been true. I have been practicing this recently and I have honestly noticed a difference. I still struggle with my own negative thoughts, but forcing myself to practice this has been a blessing. I encourage you all to try this! If you listen to my podcast I give a couple examples of what this might look like. I want you all to know that you deserve to have a morning routine that doesn’t stress you out. You deserve to feel joyful, relaxed, and content in the mornings. 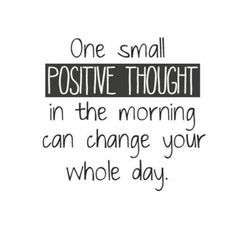 If you are able to do this, you will notice how different your whole day can be! It’s just a matter of changing your current routine, and making more time for the things you love. I do this because it’s something I really enjoy. I enjoy helping people, getting people to think, hearing from people, and sharing ideas with each other. I’d love to hear from you! Previous Post Walkin & Talkin & Donuts Oh My!